You love each other, yes, but have you tried living together? Clean up, clean up, EVERYBODY do your share. Thanks to Barney, we know that household duties should be shared and not leave one of you feeling like the live-in maid. Learn what chores the other likes to do and if you’re really lucky, your likes and dislikes will align. If not, this is where the word compromise comes into play. Not familiar with that term? Look it up and memorize the meaning – your relationship will thank you. Repeat after me: Having my personal space is vital. Finding your own little nook within your household will be prime real estate. It does not need to be anything elaborate – simply a quiet space where you can be alone. Whether it’s a corner with your favorite chair or a work space decorated to fit your personal style, it’s important to have your spot. It’s possible that the two of you have opposite tastes when it comes to styling your home. If that’s the case, I promise you it isn’t the end of the world. Remember the 10 letter word that I mentioned before? Proper communication comes into play here. 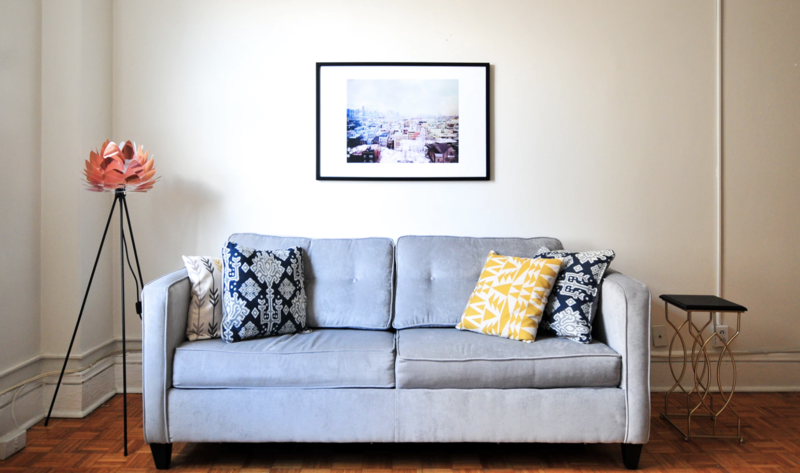 Discuss the couch – the most underrated piece of furniture. Besides the bed, it’s where you and your spouse will spend the most collective time so the both of you should agree on its style and comfort level. Beyond that, openly discuss together how to incorporate pieces of your own unique styles, cleanliness expectations and the budget for furniture. Speaking of communication, let’s talk about it. Whether you and your other half are living together or not, communication is the foundation of your relationship. Talk about IT. Whatever that it is, you should feel comfortable enough to openly discuss what’s on your mind with your boyfriend or spouse. The good, the bad, the big, the little… let’s hear it! Communication plays a key role when you two become roommates. Who is handling the bills? Who is taking the trash out? Who is buying groceries? Who is wiping off the countertops? Oh and remember, communication doesn’t need to be strictly centered around the mundane day-to-day logistics. If you think your man looks extra handsome, tell him before he walks out the door! If his slamming shut the same drawer every morning is driving you insane, tell him! Men can be a lot of things but mind reader is not typically on their resume. Throw them a bone and spell it out for them. Having the proper storage for each room will making living together so much easier. Take the time to figure out what works best. For instance, how can you best store your makeup in the bathroom so it’s out of his way but fully functional for you? Don’t forget the closet space. Get creative with who is hanging what where and who gets what drawers. This will look different for each couple as floor plans significantly vary. Rely on organization items from Target or Home Goods. They will truly become your best friends. You know how in movies they show couples moving in together, both are glowing in cute outfits as they gracefully carry in cardboard boxes with the sun hitting their face at the perfect angle and the music in the background at just the right volume? Yeah well, that isn’t real. Moving can be a pain. Before you pack up your life, read these five must-know moving tips. Even though you may not wake up every day to a full breakfast spread and chase each other around in your underwear giggling, having your spouse as your roommate is really one of the coolest things in life! Take the time to get to your know your partner through a new lens and appreciate the values and lessons that it brings to your relationship. You woke up late, spill coffee down your shirt, hit every red light on the way to work, your boss was breathing down your neck. Basically, you’re having a pretty sh*tty day so naturally you come home and unleash on your partner because there wasn’t enough ice in the freezer and you blow it up into a full blown fight. You’re not mad at him over ice. Let’s be serious. You’re annoyed because you had a less than ideal day and you’re taking it out on him because well, he’s the easiest target. One tip that I use in my personal life is to never go to bed angry and to refrain from arguing in the bedroom. Whatever it is that is going on between the two of you, hash it out before you put your head on the pillow. Going to bed without resolving the issue at hand will not only leave you tossing and turning but it will drag on and on. Stay up, squash it and move on. I’m a firm believer in good and bad energy and bringing any negative energy into the bedroom is not a good idea. While we are chatting about it, here are some pointers in how to argue with your spouse in a healthy way.